Wharton's Sidney Winter discusses a new way of looking at technological innovation. Innovative activity is what mainly separates the winners from the losers as industries evolve. The book Innovation and the Evolution of Industries puts forward a new way of looking at this central mechanism of economic growth: a systematic but ‘history-friendly’ view that takes into account the differences in industry context, as exemplified in the computer, semiconductor and pharmaceutical industries. In this interview with Knowledge@Wharton, Wharton emeritus management professor and co-author Sidney Winter discusses the book and the years-long collaboration it took with his colleagues. Winter is a Core Team member of the Mack Institute for Innovation Management. Knowledge@Wharton: Tell us about your book. Sidney Winter: Well, I should probably first tell you about my three co-authors. I’ve got one American co-author, my friend Richard Nelson with whom I’ve worked a lot over the years. [They co-wrote the seminal book on evolutionary economics, An Evolutionary Theory of Economic Change.] And then there are two Italian colleagues, [Bocconi University professor] Franco Malerba and [IUSS professor] Luigi Orsenigo. We’ve been at this together for quite a few years now. Knowledge@Wharton: All four of the authors are economists, I believe. Is the term ‘industry evolution’ a standard one in economics? Winter: Yes, we are all economists, and the answer is that, unfortunately, the term ‘industry evolution’ is not particularly standard in economics. I suspect that most of today’s undergraduate economics majors never hear that term in the course of their education. But outside of economics, in innovation studies and in the field of strategic management — also in evolutionary economics — it’s a very familiar term. Knowledge@Wharton: What does evolutionary mean in the context of economics? Winter: It means that there’s a lot of emphasis on how economic events unfold in time, especially over substantial periods of time. In particular, there’s the question of where new things come from, which is the innovation part of the story. This is pretty much what “evolutionary” means in biology, too: It’s about things unfolding over long periods; it’s also about where the new things come from. The book actually provides a strong illustration of these two themes, since it deals with the interactions between evolution and innovation. And it also illustrates a number of other aspects of the evolutionary approach. Knowledge@Wharton: The book goes on to examine the evolution of particular industries, does it not? Winter: Yes, indeed it does. It has three core chapters that deal, in turn, with the U.S. computer industry, with the semiconductor industry — considered as a supplier to the computer industry — and with the pharmaceutical industry. In each of these cases, we examine a period of about 50 years or so of actual industry history. And in our presentation, the first thing we do is to summarize that 50-year history. Then we draw on the literature that already exists about that industry in that time period, and consider the explanations it offers or the mechanisms it suggests for why the industry developed in the particular way that it did. 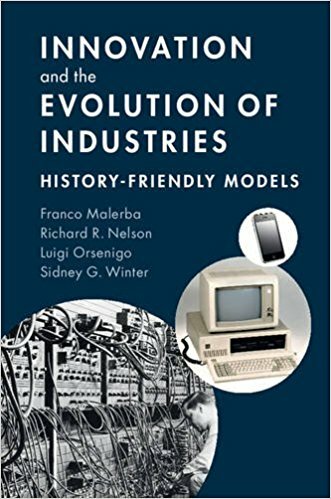 Then, drawing on that, we create a custom-made computer simulation model for that particular industry, in that particular time period, and try to build into it the mechanisms that have been previously identified by other scholars as being the important ones in history. Then we use that simulation model, and we use it first to try to reproduce some main features of the history itself — to show that, indeed, the explanations that have been suggested can be made to work when they’re spelled out in detail, in the context of a computer model. Having done that, we take up counterfactual history. We consider what would have happened if some of the background conditions of the industry had been quite different. For example, suppose that the advances achieved in semiconductor technology had been smaller than they were, or suppose that the pharmaceutical industry had a different sort of patent system facing it than the one it actually did. We examined those results to suggest what difference it would have made if those particular historical circumstances had been different. At the end of the book, we pull it all together in a summary, and we also speculate a bit about where else one could go with these kinds of methods. Knowledge@Wharton: Can you give us a general idea of how these computer models work? Winter: Yes, I certainly can. The basic aspects of these models are the same as some that have existed for a lot longer, in particular the same as some that [Richard] Nelson and I put forward back in 1982, in our book An Evolutionary Theory of Economic Change. A lot of people followed that lead and did similar work after that. So those basic building blocks are, first of all, we have model firms — individual firms are modeled as agents. This is sometimes called ‘agent-based modeling’ nowadays, but we were doing it before it was called that. And then these firms are put into a model market environment where they compete, and they set the usual things — there is price and output determination — as they do in basic economic models. Then we also have some sort of technological environment, or a technological opportunity environment, which determines what it is that the firms are able to do by spending resources on research and development activity. That research and development activity and that particular sort of environment, drives the progress in the model and provides feedback to profitability and other things. We also have some other features in each of these models, because there are always some other aspects of the setting that you have to consider. For example, there are things that determine the conditions on which firms exit the industry, and the conditions on which new firms enter the industry, which are quite important. So, we have to include the specifications of those things, too. Knowledge@Wharton: Are the model firms representations of actual historical companies, like IBM, Dell, and Intel? Winter: No, we don’t actually attempt to match our model firms to individual historical examples. What we’re hoping is that if we get the causal forces right — that if we understand the mechanisms that are shaping things — then our array of toy firms, if you want to call them that, the model firms, are going to represent the collection of behaviors that the real firms as a collection also represented. There’s one exception to that, or a partial exception to that, which is kind of interesting, and it illustrates the way the model works. As you probably know, IBM was a dominant firm of the U.S. computer industry for a very large chunk of its history — perhaps, roughly, 35 or 40 years of its history. And so, there is one dominant firm like that which is a salient feature of the particular history. It’s something you ask yourself about, if you look at that history — why did that happen, and is that related to basic conditions of the industry? We went at it with the assumption that it was related to the basic conditions of the industry and that some of the causal mechanisms that have been talked about were the relevant ones. So, we tried to build those causes into the model. Now, when we looked at simulation results, it turned out that, indeed, there was often one big dominant firm. We used to have the habit of looking at output and saying, “Well, there’s IBM,” identifying this little model firm with the historical IBM because it came to resemble it, in terms of its role in the industry. But that wasn’t designed in. That was an emergent feature, a thing that the causal forces in the model produced by themselves, not something that we designed into it. Knowledge@Wharton: When you study the history of a particular industry, what features do you look for? Winter: There are a number of things that are pretty well recognized in the industry evolution literature as being particularly important or characteristic of these patterns. And maybe the most famous of those features is the phenomenon known as the ‘shakeout,’ which means that typically in the start of a new industry, there is a period where there’s a flow of new firms coming in, and some of them succeed and some of them fail, and more come in, and more fail, and so on. But the overall result of that is when you look at the picture, the picture is one where, over a period of perhaps a few decades, at the start of an industry, the number of firms involved in it goes up, up, up — and then it reaches a peak and comes down, down, down, in quite a dramatic way. And that ‘down, down, down’ part is what’s called the ‘shakeout.’ It means a lot of firms are failing or choosing to exit from the industry. In the classic example of the U.S. auto industry, the number of firms active in it peaked above 200 before the 1920s, a few decades after the start of the industry, and then tumbled down to the “big three” over another long period of time, as a lot of those firms fell by the wayside. That’s a very dramatic feature of a lot of histories, and it’s one that they don’t tell you about in the economics courses in school. It’s one of the dramatic examples of how the evolutionary approach highlights different things than you’ve ordinarily heard about. Then there are some other major features. There’s the question of what happens to the industry structure. Do a few large firms, or even one large firm, come to dominate the scene? How does that work over a period of time? And these processes are a reflection generally of very important feedback loops, of success-breeds-success feedback for some of the firms involved. So, we look for those cumulative processes and those feedback loops. The last thing to mention is that there are sometimes discontinuities in the technological environment, which come from sources that are not really a feature of the behavior of the firms that are involved. For example, in the semiconductor industry, defense-related R&D and support of basic research relevant to semiconductors is a very, very important factor. It shapes the opportunities, and then the relatively discrete invention of the microprocessor is a very important discontinuity in the industry. In looking at the history, you look for those kinds of shaping events which may not be part of the internal logic of the economics but actually mattered to the history. And you wouldn’t get the history back, if you left those out of the story. Knowledge@Wharton: How does your approach differ from what economists might do in the same area? Winter: Well, other economists — whom we generally refer to as ‘mainstream economists’ because they’re following the mainstream of the research traditions that have dominated in the discipline since about the middle of the last century — include a few who have actually worked on the industry evolution topic, although it’s actually very few. But in general, mainstream economics likes to focus on firms trying to get exactly the right answers to their problems, by optimizing or maximizing behavior, and we do not have that emphasis at all. And the reason we don’t have that emphasis is that when you’re taking time seriously, when you’re taking the evolutionary development seriously, you also have to take seriously the fact that there is a lot of uncertainty in the world. And uncertainty makes strategic decision-making by business firms a very difficult thing. So, there are two ways to go. One way is to think harder and harder about what firms could do to try to get exactly the right answer — that’s the mainstream instinct. Our instinct is rather the opposite. Our instinct is to say, “Well, mostly firms are operating out of habits or out of rules of thumb, or out of heuristic understandings that are not precise,” and it’s those drivers — plus luck, plus chance — that actually shape the way behavior unfolds. We, in our emphasis on the unfolding in time, don’t put a lot of emphasis on the effort to get exactly the right answer– that is, the firms getting the right answer. That is a big distinction between our approach and the mainstream approach. Knowledge@Wharton: How did you come up with the idea for the history-friendly approach? Winter: Some of these concepts and some of these methods go back quite a ways — at least they go back to our 1982 book and some of the things before that. The four of us were thinking at one point in the 1990s about how we could do a new generation of work that was in the spirit of that earlier work, and use some of its methods but was more firmly dedicated to trying to understand specific pieces of reality. This would not be the typical sort of theoretical exercise where you showed, if this happens, that might happen. And you show that in a kind of de-contextualized way. But rather, to try to do an exercise where we study some actual contexts and study some actual patterns of evolution, and try to capture in our theoretical work what it was that was going on in those particular cases. So that was the idea that we came across: Let’s have a new generation that is aimed at being more directly empirically relevant, because it is dealing with things that actually happened and trying to explain them. That was where the idea came from. Knowledge@Wharton: Finally, what are some of the key takeaways from your research? Winter: We have –- at least we hope to reach — three different audiences. A very important audience for us is the audience of our scientific colleagues, of our economist colleagues and the graduate students that all of us try to raise in our own image, so to speak. And we hope that these people will be struck by the promise of the methods that we put forward — not just by our reading of these particular industry histories, but rather by the fact that it is possible to be systematic in your effort to take apart the mechanisms that were driving such a history. We hope they will be sufficiently impressed by that, to try to do some of it themselves, and we will have contributed to a wider movement that will improve our understanding of the economy. Then for managers, in particular business managers, the models and the histories have the potential, at least, to make people think a bit about a number of questions or strategic factors that are illustrated in these histories. One of the first questions is, in your situation, where are you really, relative to the shakeout? Given this very strong, typical pattern, if you’re in an industry, and the industry is 10 to 15 years old, you may well be on the way to the shakeout, not past it. So that’s an important thing to understand: There’s going to be a time of stress, in which a lot of the contenders are going to fall by the wayside. To see that — particularly in our pharmaceutical industry chapter, our discussion of why that happens and why it doesn’t happen some of the time, because it doesn’t always happen — I think that would be a useful stimulus to the strategic imaginations of managers who can match the elements of the story to their own situation and ask where they stand in those different respects. And then in some cases, the results of the work, I think, have also got an audience in the public policy sphere, where in particular some of our work with the counterfactual history and the role of the patent system in pharmaceuticals — some of that certainly opened my eyes about possibilities for causal mechanisms that were rather different than I had imagined, situations more complicated than I had imagined. And we accidentally got some of this complication more or less well represented in the models. I mean not really accidentally, but in making an attempt, we happened to have had the luck to make a good enough attempt to actually get some insight about the way those things work. So that’s another possible audience. And then lastly, there are people who are just interested in the way the economy works in an economic history, and the way industries work. There’s a lot of material in the book for them. They wouldn’t necessarily have to follow in detail our computer modeling choices that we argue for, but there’s a lot of history, a lot of suggestive quantitative results, a lot of interesting charts, and so on. I think that people who are just generally interested in the economy would find a lot to appreciate there. Outstanding interview on the subject. •	1. Entrepreneurial activities: The classic role of the entrepreneur is to translate knowledge into business opportunities, and eventually innovations. The entrepreneur does this by performing market-oriented experiments that establish change, both to the emerging technology and to the institutions that surround it. The Entrepreneurial Activities involve projects aimed to prove the usefulness of the emerging technology in a practical and/or commercial environment. Such projects typically take the form of experiments and demonstrations. •	2. Knowledge development: The Knowledge Development function involves learning activities, mostly on the emerging technology, but also on markets, networks, users etc. There are various types of learning activities, the most important categories being learning-by-searching and learning-by-doing. The former concerns R&D activities in basic science, whereas the latter involves learning activities in a practical context, for example in the form of laboratory experiments or adoption trials. •	3. Knowledge diffusion / knowledge exchange through networks: The characteristic organization structure of a Technological Innovation System is that of the network. The primary function of networks is to facilitate the exchange of knowledge between all the actors involved in it. Knowledge Diffusion activities involve partnerships between actors, for example technology developers, but also meetings like workshops and conferences. The important role of Knowledge Diffusion stems from Lundvall’s notion of interactive learning as the raison-d’être of any innovation system. The innovation system approach stresses that innovation happens only where actors of different backgrounds interact. A special form of interactive learning is learning-by-using, which involves learning activities based on the experience of users of technological innovations, for example through user-producer interactions. •	4. Guidance of the search: The Guidance of the Search function refers to activities that shape the needs, requirements and expectations of actors with respect to their (further) support of the emerging technology. Guidance of the Search refers to individual choices related to the technology but it may also take the form of hard institutions, for example policy targets. It also refers to promises and expectations as expressed by various actors in the community. Guidance of the Search can be positive or negative. A positive Guidance of the Search means a convergence of positive signals – expectations, promises, policy directives – in a particular direction of technology development. If negative, there will be a digression, or, even worse, a rejection of development altogether. This convergence is important since, usually, various technological options exist within an emerging technological field, all of which require investments in order to develop further. Since resources are usually limited, it is important that specific foci are chosen. After all, without any focus there will be a dilution of resources, preventing all options from prospering. On the other hand, too much focus may result in the loss of variety. A healthy Technological Innovation System will strike a balance between creating and reducing variety. •	5. Market formation: Emerging technologies cannot be expected to compete with incumbent technologies. In order to stimulate innovation, it is usually necessary to create artificial (niche) markets. The Market Formation function involves activities that contribute to the creation of a demand for the emerging technology, for example by financially supporting the use of the emerging technology, or by taxing the use of competing technologies. Market Formation is especially important in the field of sustainable energy technologies, since, in this case, there usually is a strong normative legitimation for the intervention in market dynamics. •	6. Resource mobilization: Resource Mobilization refers to the allocation of financial, material and human capital. The access to such capital factors is necessary for all other developments. Typical activities involved in this system function are investments and subsidies. They can also involve the deployment of generic infrastructures such as educational systems, large R&D facilities or refueling infrastructures. In some cases, the mobilization of natural resources, such as biomass, oil or natural gas is important as well. The Resource Mobilization function represents a basic economic variable. Its importance is obvious: an emerging technology cannot be supported in any way if there are no financial or natural means, or if there are no actors present with the right skills and competences. •	7. Support from advocacy coalitions: The rise of an emerging technology often leads to resistance from actors with interests in the incumbent energy system. In order for a Technological Innovation System to develop, other actors must counteract this inertia. This can be done by urging authorities to reorganize the institutional configuration of the system. The Support from Advocacy Coalitions function involves political lobbies and advice activities on behalf of interest groups. This system function may be regarded as a special form of Guidance of the Search. After all, lobbies and advices are pleas in favor of particular technologies. The essential feature which sets this category apart is that advocacy coalitions do not have the power, like for example governments, to change formal institutions directly. Instead, they employ the power of persuasion. The notion of the advocacy coalition is based on the work of Sabatier, who introduced the idea within the context of political science. The concept stresses the idea that structural change within a system is the outcome of competing interest groups, each representing a separate system of values and ideas. The outcome is determined by political power(Wikipedia). To improve competitiveness and retain sustainability, firms require new technologies and capabilities. In this age of rapid innovation and complexity, it is challenging for the firms to develop internally and remain competitive at the same time. Merger, acquisition and alliance are some of the ways to achieve this, but the primary driver is the desire to obtain valuable resources. Many acquisitions failed to achieve their objectives and resulted in poor performance because of improper implementation. 1. Improper documentation and changing implicit knowledge makes it difficult to share information during acquisition. 2. For acquired firm symbolic and cultural independence which is the base of technology and capabilities are more important than administrative independence. 3. Detailed knowledge exchange and integrations are difficult when the acquired firm is large and high performing. 4. Management of executives from acquired firm is critical in terms of promotions and pay incentives to utilize their talent and value their expertise. 5. Transfer of technologies and capabilities are most difficult task to manage because of complications of acquisition implementation. The risk of losing implicit knowledge is always associated with the fast pace acquisition.